The black-and-white cover image is striking. A beautiful young woman in a headband and bathing suit stands on a rock, graceful arms outstretched behind her, as if poised for flight. Her suit sparkles, the sun off the water dazzles, but the darkness of the sky and horizon threaten to consume the light. 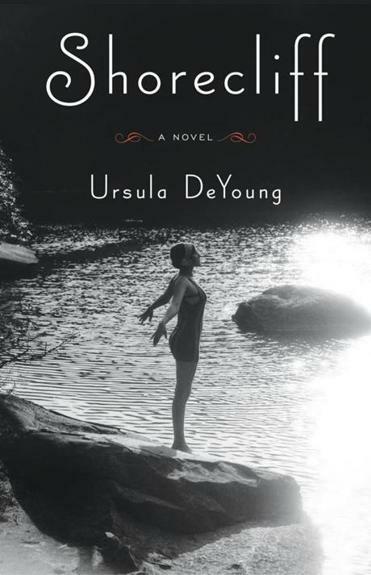 The cover, the title, even the author’s name — everything about Cambridge-based Ursula DeYoung’s debut novel, “Shorecliff,” evokes the 1920s. If we didn’t already sense it before opening the book, the family tree before the title page is another clue that we’re in for an old-fashioned novel. But this is not a multi-generational saga spanning decades; it’s the story of one transformative summer. As an only child, 13-year-old narrator Richard looks forward to the months he spends with his 10 older cousins at Shorecliff, a large, isolated, and somewhat deteriorating seaside estate in Maine. Adults are present, but generally invisible except in their capacities as cooks, cleaners, wait staff, and wardens. While Richard’s stern, distant father stays home in Manhattan, two of the married uncles and one bachelor uncle, Kurt, join the mothers at Shorecliff. So does Aunt Edie, a stereotypic spinster at age 48, with spiky hair, bad temper, and a raging opposition to confining a group of hormonal teenagers together in the same house for a full summer. She’s not entirely off-base. While Richard relishes the long days of swimming, croquet, and card games with the children of his mother’s three sisters, the older cousins are restless. Beautiful and tempestuous Francesca, the oldest cousin, feels marooned on the hillside, and desperate for novelty and adventure, self-mockingly flirts with her cousin Charlie and entices him into minor mischief. Her cousin Tom actually finds what Francesca is seeking in the arms of, yes, the local farmer’s daughter, while Tom’s cousin Yvette looks on in jealous rage. and scandalous allusions to wanton sexual behavior and gambling. For the first 50 pages or so, I thought DeYoung was simply creating the context for the plot that was about to unfold, and by the hundredth page, I was more than ready for the action to begin. But by the halfway point, I realized that this sequence of episodes — family feuds, minor adventures, night hikes, captive foxes, bad language, and revelations about the adults that, though scandalous in 1928 petit bourgeois society, are pretty innocuous to the modern reader — was all there was going to be. So I surrendered to the torpid pace, in which the plot points don’t so much build as accumulate. And like inching into icy Maine water, once I got used to it, it wasn’t bad. Yes, events advance to the climax with the speed of a croquet ball rolling across a bristly lawn, but this is, after all, a summer book. What’s the rush? “Shorecliff” is a curious book, a deliberately and surprisingly innocent story about the loss of innocence, light in action and depth, but high in integrity. It’s true to itself, this novel, and to the experience of its young protagonist. cousins were a gateway to wisdom.